The Launch Pad: Friday Fun Day #FFD - A Game of "Tag"
Friday Fun Day #FFD - A Game of "Tag"
I am starting Friday Fun Day a bit earlier today, since I'll be joining many of you in the wee hours of the morning (X PRIZE time) to watch the LCROSS impact. You must be on Facebook and be a fan of GLXP to win. If you're not a fan already, then you can become one now ---> click here to go to the GLXP fan page. At 9am PST/ 16:00 UTC today, I will post a photo in the "Friday Fun Day - Tag!" photo album on the GLXP fan page, and ask you a question about it. Your mission, if you choose to accept it, is to correctly tag the answer on the photo, with your name. For example, if I put up a picture of the South Pole of the Moon and ask you which crater the LCROSS Centaur impacted, you would tag the Cabeus crater with your name. Facebook allows a maximum of 30 tags per photo, so be as quick as you can! I'll post a second photo at 1pm PST/20:00 UTC. That's right folks! Your very own Moonpie Robot, complete with Moonpie! (Note: some assembly required). 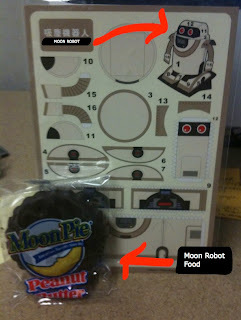 Update: Proud new owner of Moonpie Robot is Chris Radcliff -- congrats! Thanks so much to everyone that played today. This was a test of a new Friday Fun Day activity, and we'll bring it back in the future. Hope you had fun playing! Answers to the questions are below. Who will be our lucky winner? First to Facebook that correctly tags this photo, wins! Remember, you must be a fan of GLXP to be eligible. Without further ado, the second picture in our "Tag for Swag" game: some of the Apollo astronauts on July 20, 2009. This was the 40th Anniversary of the day that man first stepped foot on the Moon. Which of these men was the Capcom (capsule communicator) for Apollo 11? A: The Capcom was Charlie Duke, pictured 3rd from the right. 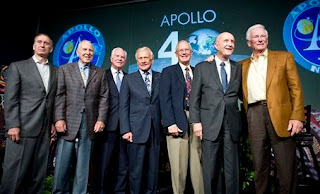 All astronauts in the photo, from left to right, are: Walt Cunningham, Apollo 7; James Lovell, Apollo 8 and 13; David Scott, Apollo 15; Buzz Aldrin, Apollo 11; Charles Duke, Apollo 16, Thomas Stafford, Apollo 10; and Eugene Cernan, Apollo 10 and 17. The first picture in today's game is in honor of some of the lunar spacecraft before LCROSS that have also met their demise on the lunar surface. 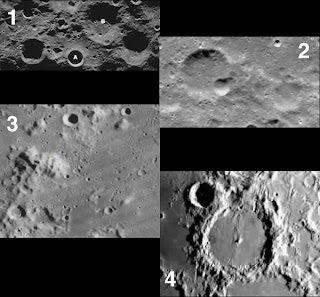 Pictured above are the impact sites of SMART-1, Kaguya (Selene), Lunar Prospector, and Ranger 9. The question I pose to you is this: Which of the lunar areas above was the site of the Ranger 9 impact? A: #4 is the correct impact site for Ranger 9. #1 = Lunar Prospector (Shoemaker, labelled "B" in the photo), #2 = Kaguya (Selene), and #3 = SMART-1.